Following the death in 1936 of the Right Rev. Joseph Cowgill, Catholic Bishop of Leeds, plans were made for a memorial to his work, prominent amongst which was the founding of the of Leeds Diocesan Rescue and Protection Society. It was decided that the memorial would take the form of a replacement for the ageing premises of the Society's St Vincent's Home for Boys at Claypit Lane, Leeds. Fund-raising began and on July 15th, 1939, just a few weeks before the outbreak of the Second World War, Bishop Cowgill's successor, Bishop Poskitt, laid the foundation stone for the new establishment at a site on Houghley Lane, Bramley, Leeds. The building was completed the following year but was immediately requistioned by the Leeds Health Authority for accommodating old people, only being returned to the Diocese in November, 1947. During the war, boys from St Vincent's were evacuated to St John's Institute at Boston Spa, the Society's home for deaf and dumb children. In 1943, the Society acquired a property at Horsfort, near Leeds, which was named St Gabriel's. St Gabriel's was originally intended as a home for babies and toddlers. 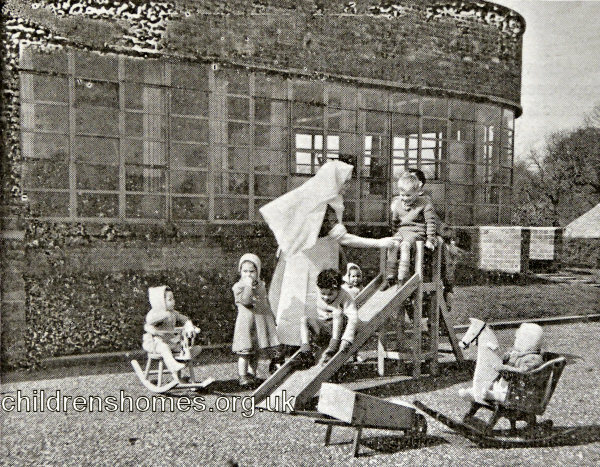 In 1946, however, it was decided to use St Gabriel's as a senior boys' home and for the Bishop Cowgill Memorial Home to become the home for babies and toddlers. In 1949, the management of the Cowgill Home was handed over to the Sisters of the Poor Child Jesus. The following year, the same order also took over the running of the Society's St Mary's Home at Boston SPa. Bishop Cowgill Memorial Home / Cowgill House, Leeds, c.1960. by the 1970s, part of the establishment, by then known as Cowgill House, had been converted into four family-group homes, each accommodating six children aged from 3 to 16 years. In 1973, the Sisters of the Poor Child Jesus withdrew from their involvement in the home, with lay staff continuing to run it. The home continued in operation until the 1980s. The buildings no longer survive and the site is covered by modern housing.